I have a list of lectures and workshops that I can offer to groups of quilters, embroiderers and other textile interest groups. If you are interested in any of these courses or lectures please use the Contact Form to e mail me your enquiry. I am now offering mentoring to individuals or groups as a way of helping people extend their practice without coming to a formal class. Mentoring is a 2 way process which relies on both parties doing some preparatory work. I will set you some questions to answer about your practice and I would also ask you to send me (via dropbox) a selection of images of your work/sketchbookwork. 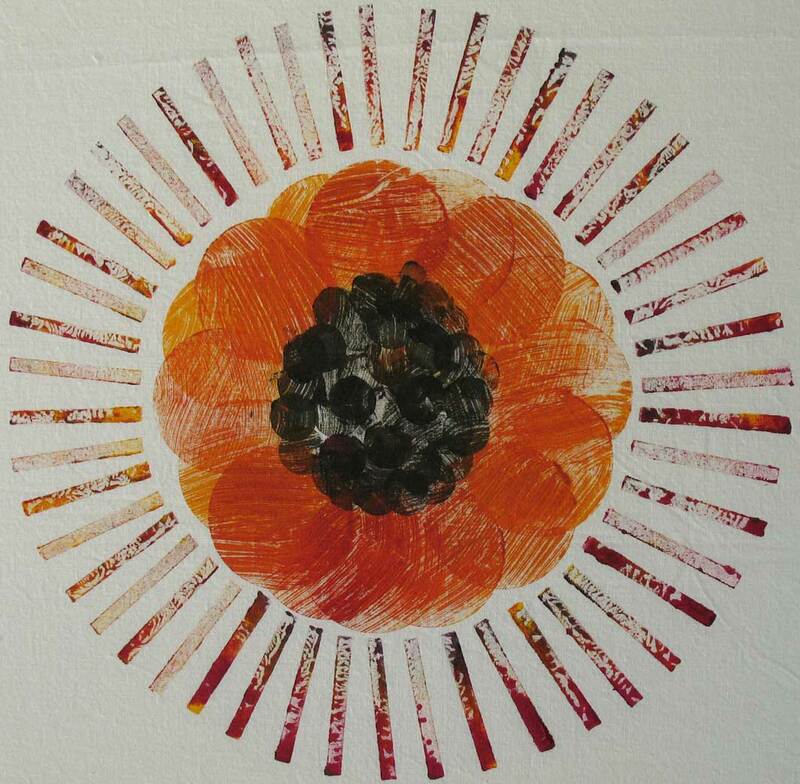 We will arrange to meet when I can see some of your work in the flesh and we can then talk through your next steps. I will then send you an action plan based on our conversation and organise a follow up session in a few months, or whenever appropriate. These all focus in some way on interests that I have and express within my own work, so there is always some imagery and discussion of work that I have done, or am in the process of making. I have my own Digital Projector and Laptop and also come with some samples and quilts depending on the topic. I would require a screen or white wall and some form of blackout, though my projector is quite good in only semi darkness! My Journey As this suggests, this is entirely about my work, inspirations, the intentions behind some of the my artwork as well as my more decorative work, and the journey I am still making. So it also looks at some of the work I am preparing for the future. Creative Use of Photography in Textiles This focuses on the way that artists are now using photography in creative ways within textile work and includes imagery from quilts, tapestry, mixed media and embroidery. Work includes the use of photographs as inspiration as well as the use of actual photographic images. 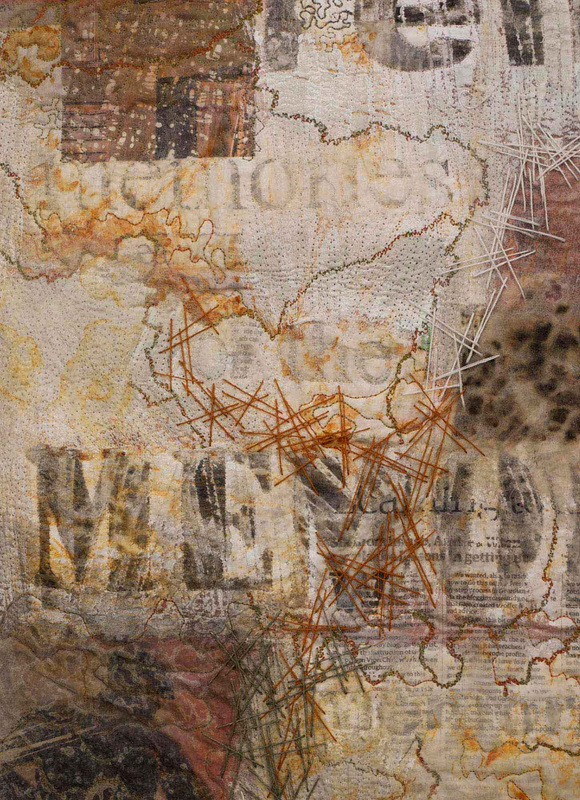 Mixed Media Textiles This lecture demonstrates how quilters and embroiderers are using mixed media within their work, exploring a range of both traditional and experimental materials to expand the surfaces and textures that can support stitchery. Textiles: Art v. Craft Potentially a little controversial, but very topical with the Tracy Chevalier exhibition at Danson House last year (2014) “Things We Do In Bed” about how quilts can be used traditionally but also to carry and convey meaning and emotion – an exhibition in which I am delighted to have been included. A brief history of how textiles have left the bed and ended up on the wall. Conjuring with Colour A trip through colours and how to use them, combine them, limit them, gain inspiration from them, and potentially how to control them! I can travel anywhere within reason and I travel with so much equipment for wet classes that public transport is not really an alternative to my trusty car! I can also host workshops here at Studio 11 for groups who are local, or looking for a day out! This makes the list of potential workshops longer and are separately listed below just as ideas/titles that can be tailored to group requirements. Monoprinting with Shapes and Plates Half day Workshop. Creating patterns and textures with acrylic shapes and on small and larger plates. 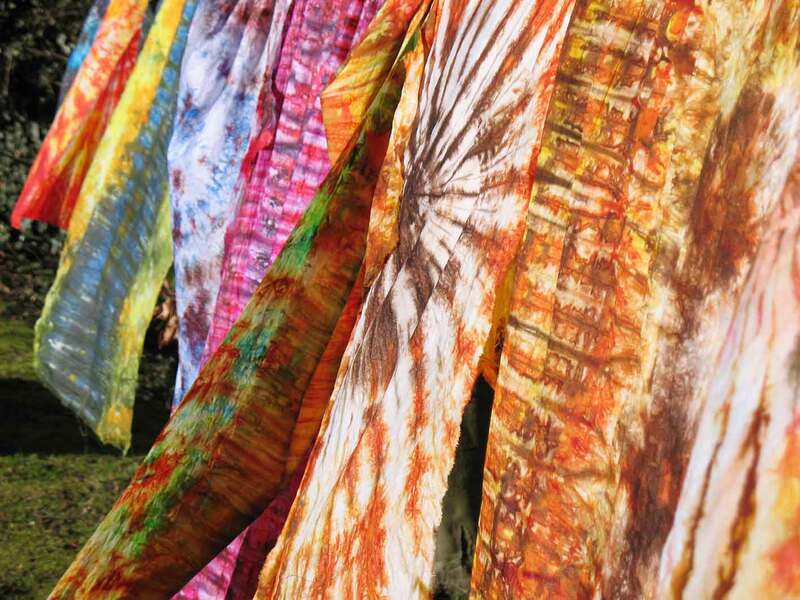 Using dye paints so as not to affect the hand of the fabric but still retain brilliant colour and texture from the unique prints that each shape and mark brings. I can include canvas bags for printing with acrylics too which require no prep and little treatment afterwards to make them fast. 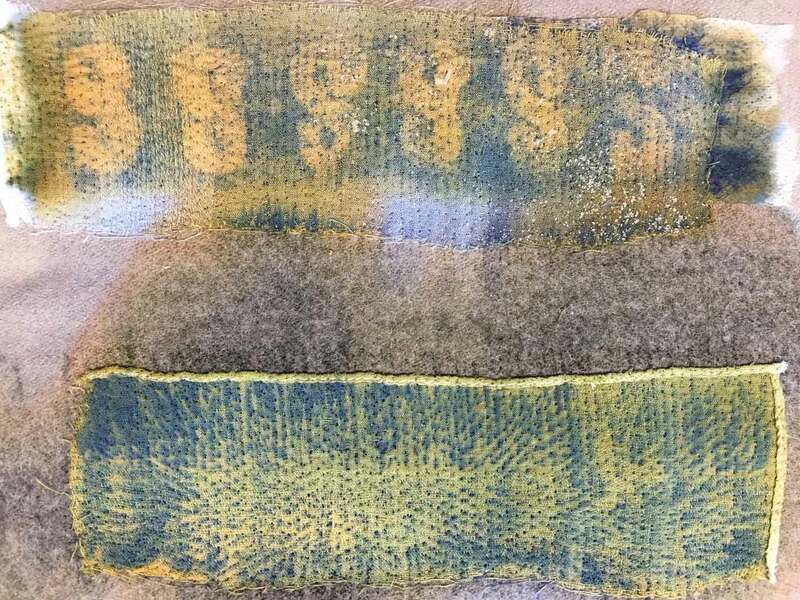 Cloth & Paper: Paper Lamination Half, 1 or 2 day Workshop This is an introduction to working with mixed media and combines found and printed papers with transparent and solid cloth. Found papers can include books, newspapers, music, non glossy magazines and printed papers can include copies of students’ own photographs. Colour & Texture Full day Workshop This workshop requires access to 2 sinks and a washable floor as dye and soda get everywhere! A full day of dyeing to create interesting colour and texture combinations. Exploring tray dyeing where manipulation of fabric creates patterns but more than one colour can be applied, as well as shibori dyeing (posh new term for tie dyeing) using clamps, acrylic shapes, sticks and folding to create patterns and textures which are then immersed into a single colour in a bucket. Quilting for the Terrified Full day Workshop Using simple print techniques and shapes to create some patterns to work with, this is primarily a free motion quilting workshop. 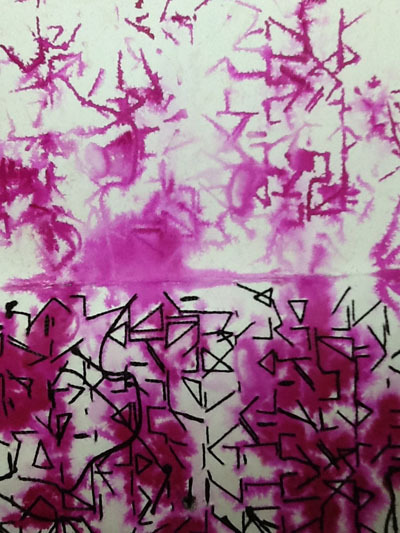 The printing will be dry within an hour whilst we explore ways of creating continuous line patterns initially on paper. Then some tips and tricks to demystify free motion quilting and make it a little easier before embarking on some quilting on the printed fabric. Ideas about working from the back of the work will also be given. 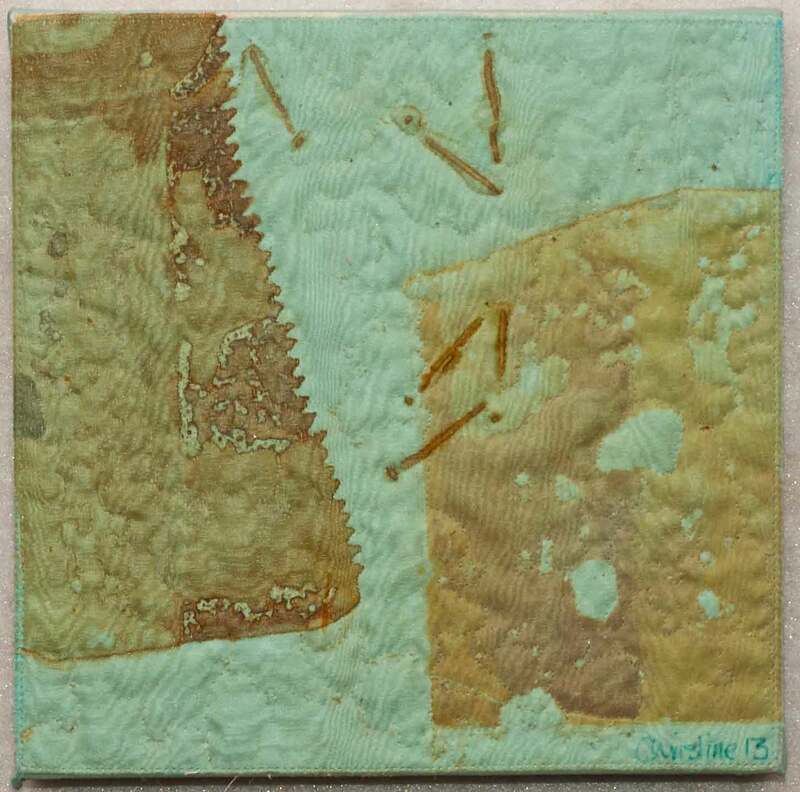 Design & Play Half or Full day workshop An introduction to some basic but fundamental design elements that will improve composition within either quilts or embroideries. I taught C&G Design & Craft for many years and was lucky enough to be working within an art school environment who gave me many hours to include lots of design work in my courses, so I have a wide range of playful and fun ways of teaching design which does not involve scary drawing! Guildford Quilters enjoyed two days with Christine this week. At our monthly meeting Christine gave a very informative talk on the historical relationship between art and quilting. The next day we had a workshop on Free motion quilting for the Terrified. We had a really enjoyable day and all agreed we had learnt a great deal.